High Street giant Marks & Spencer has announced a 14.7% pay rise for staff under an improved offer following a campaign against the company. The retailer said customer assistants will receive £8.50 an hour – £9.65 in London – from next April, well above the Living Wage of £7.20 and the voluntary rate of £8.25, and £9.40 in the capital. But premium payments for Sunday working will stop, and there will be one standard payment for Bank Holidays. Labour MP Siobhain McDonagh, who handed in a 90,000-name petition to the company yesterday, criticised the announcement, saying staff will earn no more money in three years’ time than they do today. Campaigners had warned that thousands of staff would lose more than £1,000 a year under planned changes to pay. M&S said it had listened to views and suggestions and had made a number of changes to its original proposals. Retail director Sacha Berendji said: “We’ve listened to our colleagues, acted on their feedback and are pleased that we’ve reached an outcome that gives enhanced support for our colleagues as well as making necessary changes to our business. 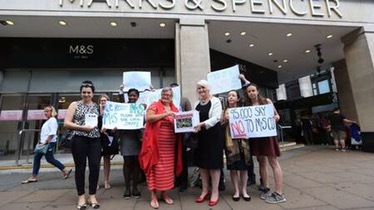 John Dorrington, chairman of the firm’s Business Involvement Group, said: “On behalf of the Group, our elected employee representative body, we are satisfied that we have concluded a period of robust collective consultation where all views from across M&S have been strongly represented. Ms McDonagh said: “While we are obviously glad that the new offer is better with regard to pay compensation packages, it still falls short of the offer that long-standing and loyal staff from Britain’s premier retailer really deserve. “What M&S is telling them is that even if they work longer hours to make up the difference, they will earn no more money in three years’ time than they do today. How is that fair? M&S is saying that no employee will be worse off as a result of these changes. “Who thinks their gas bills, electricity bills and their rent, and travel fares will be the same in 2019/2020 as they are today? Inflation means that these employees will be relatively significantly worse off, and that’s not even considering their pensions. Posted on September 2, 2016, in #retail, #uk, Other. Bookmark the permalink. Leave a comment.